Figure 437 from Chapter 16 (Cytoplasmic matrix and cytoskeleton) of 'The Cell, 2nd Ed.' by Don W. Fawcett M.D. 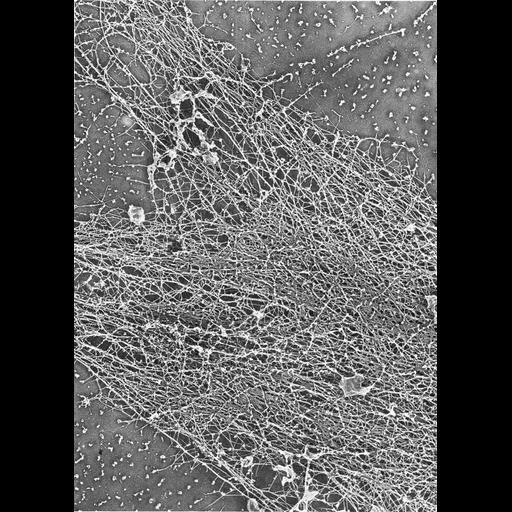 Cytoskeleton from the peripheryof a 3T3 cell, treated with Triton, washed, quick frozen with liquid helium, deep etched, and rotary shadowed. This low magnification image shows a complex cytoskeletal network composed primarily of actin. Image by John Heuser. A PDF copy of the accompanying chapter is available on the ASCB’s BioEDUCATE website.